The Young Planners Group is proud to announce the 8th Annual Mentorship Program! We encourage both seasoned and emerging planners to participate in this dynamic program. This is a great opportunity for students and young planners to get connected with experienced planners in the industry and for mentors to give back to the profession. 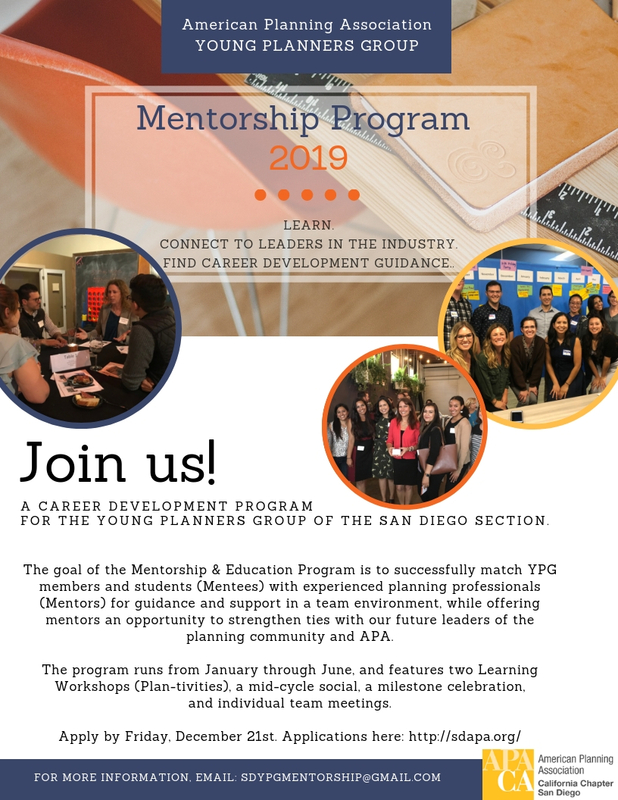 The goal of the Mentorship Program is to successfully match emerging planners and students (Mentees) with experienced planning professionals (Mentors) for guidance and support, while offering mentors an opportunity to strengthen ties with our future leaders of the planning community and APA. Each Mentorship Team is generally made up of: one (1) Senior-level Planner; one (1) Associate or Assistant-level Planner; and 1-2 Mentees. The ideal mentorship group will form bonds that extend past the life of the Mentorship Program cycle. After applying for the Mentorship Program all participants are required to attend the Kick-Off Matching Event.This will resemble a speed networking event where participants will get a chance to meet each other and then rank their preference of Mentor or Mentee. Mentorship Groups will be assigned after the Matching Event. Registration for the Mentorship Program is a 2 Step Process. Senior Level Mentors are practicing planners with significant experience and knowledge of planning issues and the profession. Mentors have a range of experience and provide technical assistance, guidance, support and feedback. Typically senior level mentors have 7+ years of relevant industry experience. Apply here if that’s you. Mid-level Mentors are practicing planners with experience and knowledge of planning issues and the profession. They are able to provide guidance and support to students and YPG members with less experience in the field, however may also be seeking guidance from a senior mentor. Typically mid-level mentors have 2 – 7 years of experience. Apply here if that’s you. Mentees are students and YPG members who are less experienced in the planning profession and are interested in learning more. Apply here if that’s you. If you are unsure which level you fall under or have any questions, please email us at sdypgmentorship@gmail.com.